I am not a wine connoisseur at all. I admit I don’t know that much about the stuff, other than I enjoy the occasional glass (or two) with dinner. As we are heading to wine country in California soon, I figured I should get a little something nicer to drink my wine out of than my titanium mug. I find the metal makes the wine taste weird. Anyone else have that problem? Just me? I went grocery shopping yesterday and was having a good browse. It was one of the first days back from our 10-day vacation, which means I had very little kid-free time for 14+ days and I was savoring my quiet time at the market. As I was cruising the wine aisle, I saw these little green boxes and decided to take a closer look. BINGO! 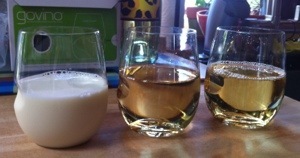 A plastic wine glass, that didn’t have a stem, was BPA-free, and looked nice to boot! Checked the price-$12.99 for a set of 4, which was in my price range, and chucked them in the cart. 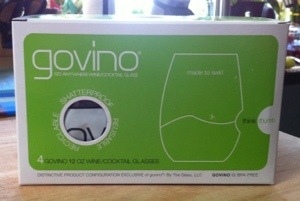 I figured these Govino Wine glasses were the ticket! 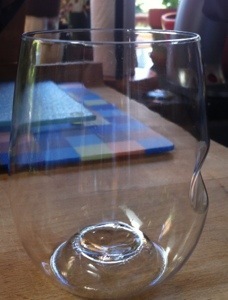 Looking at their website, they also have champagne flutes, decanters, and wine glasses in other sizes. I picked up the 12oz one. Tonight we decided we should test them out (plus I did a TON of yard work today, another fun hobby of mine, and my back and brain was screaming for a glass of wine). Pulled them out, hand washed them, and poured us up some drinks! Laddy wanted to try them too, as you can see. They claim the polymer the glasses are made of reflects the color of the wine and projects aromatics – just in case that is important to you. I see them as a vehicle to transport liquids to my mouth, and for that they worked great! I like the special little indent that you put your thumb in so you don’t drop your drink. Even Laddy thought that was kind of fun! They are going to be handy to have along with us. There are 2 downsides I see right off: 1) they don’t stack, so my plan is to keep them in their box in one of my storage bins. 2) the edge along the top is sharp, so you have to be careful. We didn’t have any problems, but beware. They are hand wash only, which on the road is the only way we wash, so no big deal there. They claim you can drop them and they won’t break and I did by accident while washing them in the sink, with no ill affects. When you get tired of them, you can just recycle them. So far, new favorite thing! You get 3 thumbs up from us! Cheers!